BUDVA/SARAJEVO - Ministers for Economic Affairs of the Western Balkans gathered today for a conference in Budva and expressed their commitment to continue regional cooperation based on principles of accountability, participation, solidarity and good neighbourly relations. In this way, they will contribute to the growth of competitiveness and development of the economies and business in South East Europe (SEE). In the declaration adopted at the end of the Ministerial Conference of the South East Europe Investment Committee (SEEIC), entitled ‘Sustainable development in SEE by Increasing Competitiveness’, the Ministers stressed their willingness to "do their best to implement the SEE Development Strategy 2020”. To achieve these goals, the Ministers agreed, inter alia, to improve dialogue, as well as the exchange of information related to economic reforms. In addition, they will facilitate the development of the economic corridors in SEE by exploring the possibilities for establishing industrial clusters or business zones within these corridors. One of the planned activities entails the elimination of the main obstacles hindering the development of entrepreneurship, and they will also initiate the development of joint regional brands. Opening today’s conference, the Minister for Economic Affairs of Montenegro, Vladimir Kavarić, pointed out that the migrant crisis, as well as the Eurozone crisis, the events in Ukraine and those in the Middle East had negatively affected all of the SEE. For this reason, the continuation of reforms is of vital importance for establishing trust and expanding the cooperation in the region, said Kavarić. He also emphasized the importance of strict implementation of the SEE Strategy 2020 of the Regional Cooperation Council (RCC). The RCC Deputy Secretary General, Gazmend Turdiu, pointed out that the two key activities within the SEE Strategy 2020 for the next two years were the establishment of agriculture and tourism working groups, as a basis for policy reform in these areas, and the development of joint regional branding presentations. In addition to regional cooperation, Turdiu stressed the importance of deepening the cooperation between the SEE and Turkey, as one of the four key investment partners in SEE, alongside Italy, Germany and the United States. Aiming to achieve a successful implementation of the SEE Strategy 2020, the Ministers called on the RCC to develop the necessary analyses and foster synergy and complementarity with other initiatives, to enable the successful implementation of the Strategy priorities. At the end of the Ministerial Declaration, the EU is urged to continue supporting the work of SEEIC, through its enlargement processes. Today's SEEIC Ministerial Conference in Budva was held under the joint auspices of the Ministry for Economic Affairs of Montenegro, which is currently co-chairing the Investment Committee, and the Regional Cooperation Council. 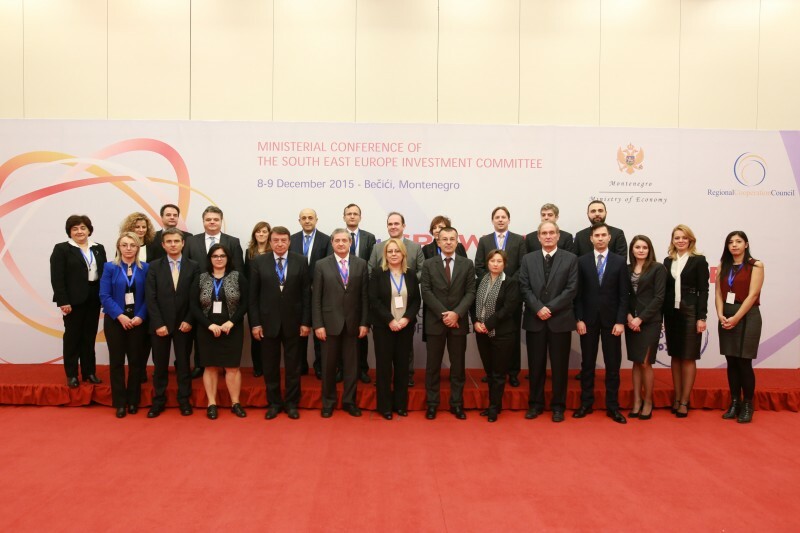 The co-chairmanship of the SEEIC will be taken over by Serbia in 2016.